Eau Claire County is a county located in the U.S. state of Wisconsin. As of the 2010 census, the population was 98,736. Its county seat is Eau Claire. The county took its name from the Eau Claire River. Eau Claire County is included in the Eau Claire, WI Metropolitan Statistical Area as well as the Eau Claire-Menomonie WI Combined Statistical Area. Eau Claire county was originally set off as the Town of Clearwater in Chippewa County in 1855. The name was changed to the Town of Eau Claire on March 31, 1856. The entire town was separated as Eau Claire County by an act of the Wisconsin State Legislature on October 6, 1856. According to the U.S. Census Bureau, the county has a total area of 645 square miles (1,670 km2), of which 638 square miles (1,650 km2) is land and 7.3 square miles (19 km2) (1.1%) is water. As of the census of 2000, there were 93,142 people, 35,822 households, and 22,281 families residing in the county. The population density was 146 inhabitants per square mile (56/km2). There were 37,474 housing units at an average density of 59 per square mile (23/km²). The racial makeup of the county was 94.96% White, 0.52% Black or African American, 0.54% Native American, 2.52% Asian, 0.03% Pacific Islander, 0.33% from other races, and 1.11% from two or more races. 0.94% of the population were Hispanic or Latino of any race. 37.4% were of German, 21.5% Norwegian and 7.0% Irish ancestry according to Census 2000. 94.2% spoke English, 1.6% Hmong, 1.6% Spanish and 1.0% German as their first language. There were 35,822 households out of which 30.00% had children under the age of 18 living with them, 50.60% were married couples living together, 8.60% had a female householder with no husband present, and 37.80% were non-families. 27.10% of all households were made up of individuals and 10.10% had someone living alone who was 65 years of age or older. The average household size was 2.46 and the average family size was 3.02. In the county, the population was spread out with 23.40% under the age of 18, 17.10% from 18 to 24, 26.70% from 25 to 44, 20.50% from 45 to 64, and 12.20% who were 65 years of age or older. The median age was 32 years. For every 100 females, there were 93.80 males. For every 100 females age 18 and over, there were 90.60 males. Eau Claire county is served by the Chippewa Valley Regional Airport (KEAU). The legislative body of Eau Claire County is the non-partisan 29-member Eau Claire County Board of Supervisors. Members of the board of supervisors are elected by district and the chairperson and vice-chair positions are elected from within members of the board. The board meets in the Eau Claire County Courthouse in downtown Eau Claire, with its weekly meetings televised on local public television and transcripts published online. Most items are approved on a "consent calendar" without discussion. Public comment is limited to three minutes per individual per item. Eau Claire County contains portions of the Wisconsin State Senate districts 23 and 31, represented by Terry Moulton (R) and Kathleen Vinehout (D) respectively. It also contains portions of Wisconsin State Assembly districts 68 (Kathy Bernier [R]) and 93 (Warren Petryk [R]), as well as almost all of district 91 (Dana Wachs [D]). At the federal level, the entire county is contained within Wisconsin's third congressional district, which is represented in the United States House of Representatives by Ron Kind (D). Attractions include the Chippewa Valley Museum in Eau Claire, Dells Mill Museum in Augusta, Dells Mill Water Powered Museum in Augusta, the Paul Bunyan Logging Camp in Eau Claire, and the Sarge Boyd Bandshell in Eau Claire. Political map of Eau Claire County, showing major and minor civil divisions, and adjacent counties. Note: A small portion of the city of Eau Claire is in Chippewa Co.
^ Taken from Wisconsin Blue Book 1991-1992 p. 731; cited there as from "Wisconsin Historical Records, Origin and Legislative History of County Boundariesio in Wisconsin, 1942." ^ "Dictionary of Wisconsin History". Retrieved 1 January 2007. ^ When Counties Originated from rootsweb.com's Oconto County, Wisconsin webpage Archived 2007-03-29 at the Wayback Machine. ^ "Eau Claire County – County Board of Supervisors". Co.eau-claire.wi.us. Archived from the original on 2011-11-12. Retrieved 2011-11-02. Bailey, William F. (ed.). History of Eau Claire County, Wisconsin, Past and Present. Chicago: C. F. Cooper, 1914. 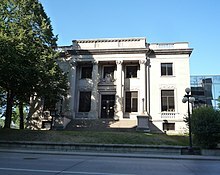 Wikimedia Commons has media related to Eau Claire County, Wisconsin. This page was last edited on 9 March 2019, at 10:46 (UTC).